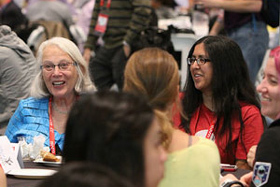 Want to meet up with other women attending Strata Data Conference? Then be sure to come to the Women in Big Data Luncheon on Wednesday. We’ll enjoy a brief program as well as time to network over lunch. Come learn from machine learning engineers and data scientists from Airbnb, Google, LinkedIn, Pinterest, and Salesforce on what it takes to do their job. How did they get where they are now? What was their motivation? What techniques do they use? How do they keep up with the pace of the industry? What are their contributions? The challenges they face? If you’ve got more questions, bring it on. These accomplished ladies are eager to answer. Suja Viswesan, moderator: Suja is an engineering director at LinkedIn, where she leads the engineering teams that are responsible for the company’s big data platform. Her org is responsible for the big data ecosystem that includes data management, core Hadoop, Spark, and workflow management. This platform is leveraged by LinkedIn to make key business decisions and also powers products like “People You May Know” feed relevance. Some of the open source contributions from the team include Gobblin, Azkaban, Dr. Elephant, and the Hadoop Gradle plugin. Previously, Suja led the Hadoop team at BigInsights and database teams at IBM. Suja holds an MS in computer engineering. Suja is very passionate about coaching and mentoring, particularly women in tech. She has participated in various panels and talks at Women In Big Data, DataWorks summit, Girls Who Code, LeanIn, Girls Scouts, and universities. Pi-Chuan Chang: Pi-Chuan is a senior software engineer on the genomics team within Google Brain. She is a key contributor to the open source software DeepVariant, released in December 2017. Previously, she led machine learning projects with public launches in various product areas such as YouTube video personalization, NLP features in search, semantic parsing for voice actions, and more powerful sequence models in LinkedIn search. Pi-Chuan holds a CS PhD from Stanford, where she specialized in natural language processing (NLP) and machine translation, as well as a BS and MS from National Taiwan University, where she worked on better language modeling for Chinese speech recognition systems. Jieying Chen: Jieying is a machine learning engineer at Airbnb. Previously, she was a software engineer at Google, working on ads spam and search infra analytics, and a machine learning software engineer at LinkedIn. She holds a PhD in information theory from Northwestern University. Stephanie deWet: Stephanie is a machine learning engineer on the content modeling team at Pinterest. She has worked on many personalization problems, including recommendations and content blending, and is currently building user models. Stephanie holds an MS in computer science from the University of Wisconsin and a BS in physics from Rice University. Mina Doroud: Mina is a staff data scientist at LinkedIn. Previously, she was a data scientist at Twitter. Her expertise lies at the juncture of big data analytics and social computing. Mina holds a PhD in computer science from University of California, Davis. Leah McGuire: Leah is a principal member of the technical staff at Salesforce, working on automating as many of the steps involved in machine learning as possible. Previously, she was a senior data scientist on the data products team at LinkedIn and a a postdoc at the University of California, Berkeley. She holds a PhD in computational neuroscience at the University of California, San Francisco, where she studied the neural encoding and integration of sensory signals. 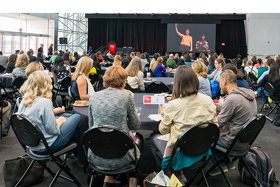 This event is open to Strata Data Conference attendees with a Platinum, Gold, Silver, Bronze, or Women in Big Data Lunch pass. All genders are welcome, and there’s no need to RSVP. We’ll see you there!